Introduction: Under Armour is a giant in the sports apparel industry and has now firmly set their sights on addressing the fishing market. The team at Under Armour has been hard at work creating technical garments that are specifically tailored towards anglers, and this season they introduced their highest end set of foul weather gear yet with their new Ridge Reaper Hydro Jacket and Bib. About Under Armour: Is there any sport that Under Armour has not yet conquered? It certainly doesn�t seem like it. The company originally started back in 1996 by making moisture wicking T-shirts with synthetic fabric. These shirts soon became popular among football players and Under Armour experienced rapid growth. Since then Under Armour has expanded from sport to sport, providing their own unique take on advancing the technical apparel in each application. The company�s meteoric rise in both fishing and hunting has been nothing short of amazing. Walk into any big box retailer or browse the pages on major e-tailors and you will find a dizzying assortment of Under Armour shirts, pants, shorts, and hoodies designed specifically for anglers. The company took things to the next level this season with the introduction of their Ridge Reaper foul weather bibs and jackets. 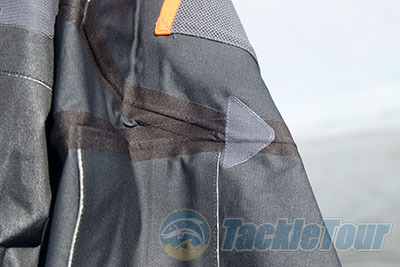 Part of the company�s HYDRO ARMOUR collection these garments are designed specifically for anglers. 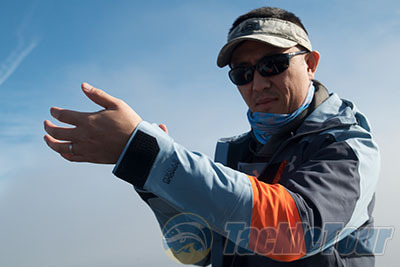 Unlike many competitors the Ridge Reaper bibs and jackets are intended not just for freshwater anglers but saltwater fishing as well, and includes numerous features designed specifically to shield anglers from a wide array of elements. The Ridge Reaper: The first thing I noticed about the Ridge Reaper foul weather gear was they just looked stylish. These are not your run of the mill blacked out garments. They are aggressively styled and feature colors that call for attention. 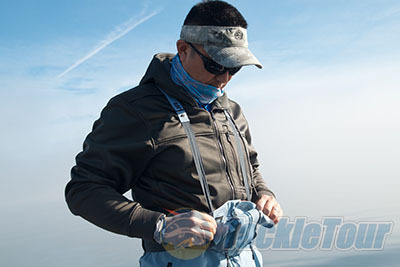 There bibs are available in only one pattern but the jacket comes in both a more traditional blue color (Stealth Pattern), and a camouflage version (Ridge Reaper Pattern). All of the garments are further set apart with a bright orange band on the arm or leg which only adds to the aggressive styling of the gear. 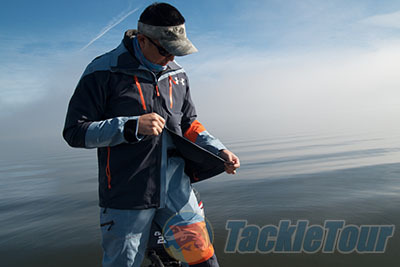 Real World Tests: For the purposes of this test we decided to review the Ridge Reaper Jacket and Bib as an entire set. They are designed to be used together but can certainly be paired with garments from other brands. 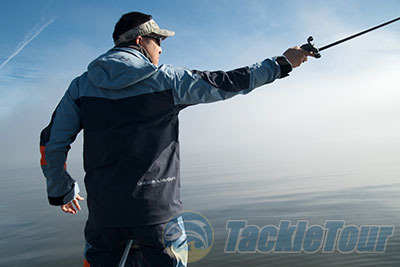 For our tests we fished with the Ridge Reaper for three months on the California Delta, Clear Lake, and also local reservoirs in the San Francisco Bay Area. Unlike the last few years of drought we were blessed with an El Nino pattern which brought an abundance of rain to the Bay Area this winter. 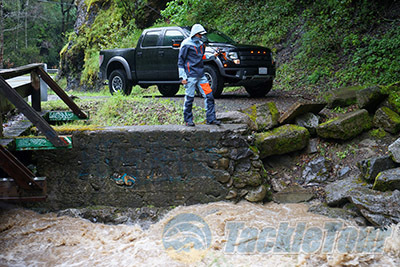 To further test durability and mobility of the garments we also fished from shore and even went on a few hikes in the rain. 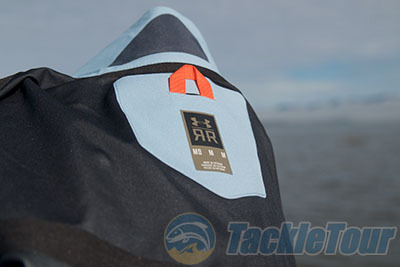 Quality/Construction: The Ridge Reaper features a 100% polyester material construction that is both breathable and waterproof, critical factors in good foul weather gear. The Ridge Reaper features a 20K/20K waterproof rating. So what does this rating actually mean to anglers? 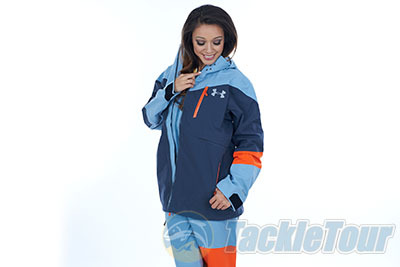 Manufacturers like Under Armour describe the waterproof breathability of fabrics with two numbers. The first is in millimeters (mm) and is a measure of just how waterproof a fabric is. For example in the case of a 10k or 10,000 mm fabric, if you put a tube with inner dimensions of 1� x 1� over a piece of this fabric, you could fill it with water to a height of 10,000 mm (32.8 feet) before water would begin to come through the material. Thus the higher the number, the more waterproof the fabric is. The second number is how manufacturers measure just how breathable the fabric is, and is described in terms of how many grams of water vapor can pass through a square meter (m2) of the fabric from the inside to the outside over the course of a 24 hour period. In the case of the Ridge Reaper for example the 20k fabric would be 20,000 grams. The larger the number, the more breathable the fabric. 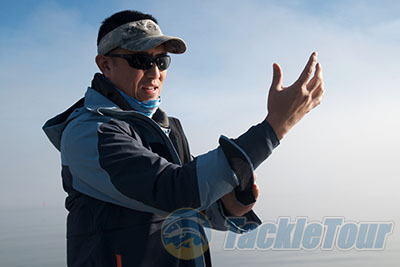 Most anglers are going to be fine in most conditions with a 10K/10K rating but outdoor enthusiasts or fishing guides will definitely benefit from the higher rating. The overall build quality of the Ridge Reaper is very good and all the seams are taped up, and many of the key panels on both the jacket and bibs are well reinforced. Both garments have an abundance of storage, some of which is contained within the waterproof zipper pockets. One of the more interesting construction elements of the bibs is that they go all the way up the chest, which is higher than most competing bibs, and offers an added layer of protection from wind and rain. 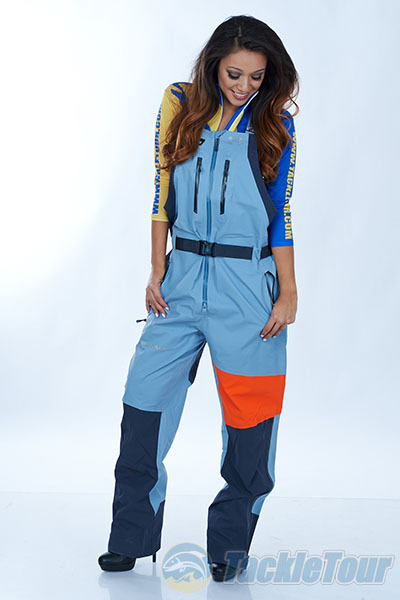 The bib is attached to the suspenders with two buttons and can be pulled down to provide access to your shirt. While this is a nice feature I did experience many times the buttons coming loose and allowing the front panel to come down unintentionally. This would happen whenever there was too much pressure on the suspenders, for example when I bent down to land fish or reached into the livewell. I ended up loosening the suspenders which helped, but either larger buttons or a clip fastening system would help eliminate this issue.